It has a chassis battery disconnect. Mine is open, sitting outdoors for 7 days with chassis battery voltage holding steady at 12.7; we have a 10 watt solar panel feeding this system. I’m going to close the switch tomorrow and see what happens during the next week. What a cute emogi (spelling). Wife got a big laugh and asked "where did he get that". UNCNavy2000 described what the BIRD system does for diesel and gas Newmars. It monitorers the chassis and coach battery voltage and if there is more than 13.2 volts for more than about a minute it closed the relay that connected the battery banks. It also has a similar delay before opening the relay when the voltage dropped below 13.2 volts. The diesels have a 200 amp relay and gas has a 100 amp relay. This enables charging from line, generator, or solar sources. I installed Lifeline batteries in the chassis and coach banks and have a shunt on each bank. I see solar power charging both banks when the solar charging voltage exceeds 13.2 volts. The AGM's low internal resistance allows the hungrier bank to get the Lions share of the charging current. The 220 AH chassis bank gets full first and I can see the amps drop to .2 to .4 amps and the coach`s 800AH bank will be getting up to 60 amps as the sunny summer day wears on. Turbopilot, if the SL can close the relay when the engine is running or the charger is on maybe the BIRD logic is also in the SL sensor and system but the Newmar installation did not program or wire it properly. Or, if the relay closes only when the engine is running then there may be only a wire between the alternator and relay that supplies the voltage to close the relay. I have traced the wiring from the SL TM102 coach controller, so I know how it is wired. What I don't know is the logic used in the TM102. TM102 knows when the ground power charger is in float and it knows when the engine alternator is running so I am guessing it uses that logic to open the solenoid. I did confirm with SilverLeaf that the Newmar implementation of SilverLeaf has no logic to determine if a solar controller is on line in float. SilverLeaf does have software and modules to interact with solar controllers but SilverLeaf advised me Newmar has not approved that functionality. So we have a hole in the SL system that can lead to discharged chassis batteries. This hole is compounded because MyRozie still does not have the logic to alarm when chassis battery is low. You can see the chassis battery level when you log in to MyRozie, but no automatic alarm when it gets low. I have been operating all electric, solar equipped RV's for 8 years. Previous to the Newmar all of my coaches had a Blue Sea ML-ACR Automatic Charging Relay. You will find these relays in high end yachts. It operates similar to a BIRD controller but has more logic. It also has a switch allowing both manual and auto modes. I am considering ripping out the SL controlled solenoid in my NA and replacing it with the Blue Sea ACR. The device will then control the timely opening and closing of the connection between the house and chassis electrical system as long as it senses some source is delivering a charge in the typical float voltage level range. 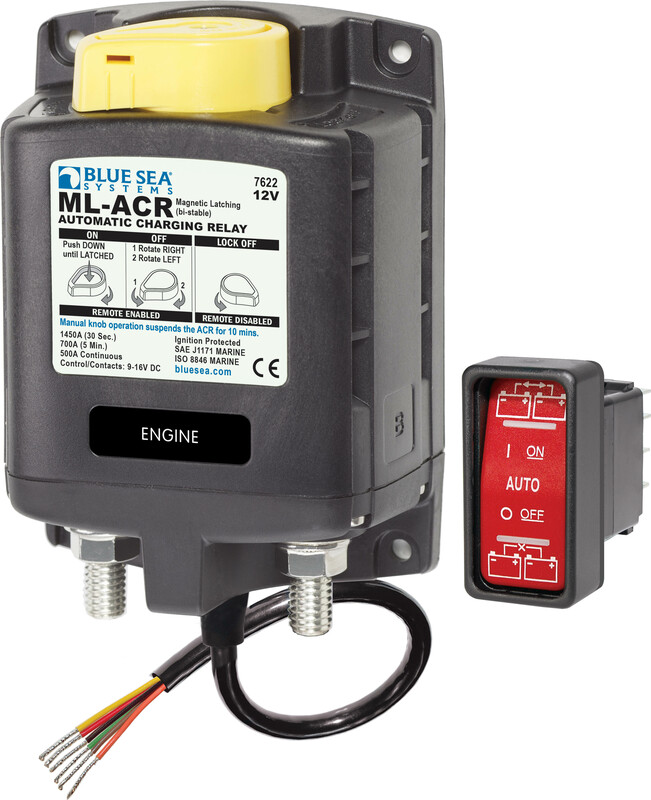 The Blue Sea ACR seems to be smarter that the SL controlled solenoid. To the best of my knowledge this issue is not exclusive to the NA. All KA's and Essex coaches should have the same issue if solar equipped. I use an iPad Pro. When you quote & reply, a box w/Smiles appears on the right. Click on the word [More] at the bottom to get an expanded page of choices. If you use the “Quick Reply”, click on “Go Advanced” at the bottom to get the box w/Smiles. I think we should make it the official logo of the "AireHeads". Could have some decals made up to put on the back of our coach. Turbopilot, it may be less expensive to use a 13.2 volt sensing normally open relay or solenoid connected to your house battery bank. Add a diode on a wire from the relay output to the terminal that closes the NA's solenoid that connects the chassis and house battery banks together. Then. add a diode to the SL or sensor wire that is already there (so power does not go the wrong way to the sensor or SL system) and reconnect it. Then any charging source that is 13.2+ volts will also charge the chassis battery bank too. When the battery banks are resting (over night) the relay will be open with no solar power or charger power. I had such a solenoid that connected the battery banks when the alternator was running in a 2005 Sprinter based Class B. The alternator burned out and when the engine battery voltage dropped the dash lights went screwy and I stopped at at the Lebec Flying J for fuel. The engine would not restart so a jump allowed me to start and park in an empty slot. I changed the wiring from the alternator to the house battery bank voltage and when I started the 2.5KW Onan Propane generator I got the power to start and run the engine and recharge the engine battery even though the alternator was dead. I drove a 1,000 miles to Portland, OR and the only competent Western North America mechanic who knew what a Sprinter was. The alternator was replaced and solenoid rewired an trouble was gone. Didn't know that. You should be ok with battery boost switch down for storage. Is it "normal" to be seeing a 8-10 amp FLOAT charge while plugged in? Realizing we have a couple of chassis batteries and 8 house batteries but that seems like a lot of float? The number shown on SilverLeaf shows output of the charger, not the charge to the battery. You need a battery monitor system for that. Suggest Victron. Once all batteries are charged in float the number showing on SilverLeaf should represent current load demanded by all the DC components on board. Before full charge is reached the SL number represents a combination of battery charge and coach loads. Thanks. That should work but for $193 for the Blue Sea ACR and redoing four wire connections, I would have a better system than what is currently installed. I have thousands of hours experience with the Blue Sea ACR. I just works. I don't have a Newaire, but I think that all these modern coaches have significant phantom loads even when everything is switched off. A 10w solar panel is likely insufficient to offset these except perhaps in ideal conditions. Since you have a substantial investment in your batteries, why not protect it by turning off all power at the batteries when the coach is stored and not plugged in? I store my coach plugged in to shore power, but if I didn't that is what I would do. I would add cutoff switches at each battery bank if the factory did not provide them. I store my coach plugged in to shore power, but if I didn't that is what I would do. I would add cutoff switches at each battery bank if the factory did not provide them. Ward have you called Newmar support to get answers directly from them?